Custom handbuilt moving coil cartridges with the coil of a GRASSHOPPER III and the frontpole and suspension of the GRASSHOPPER IV: the best cartridge available for its price. 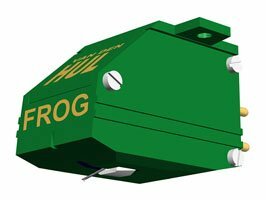 The production time for a The FROG ® cartridge after ordering is about two weeks. Please call your authorized distributor for delivery time.